Bristol Yoga Centre gift vouchers are available to purchase via email or post all year round. They can be sent as an attachment for you to print out, or posted to you with a beautiful gift card. The minimum voucher amount is £24 (you will receive 2 x £12 vouchers), or any denomination above that. The voucher can be used to pay for workshops, private lessons, drop-in classes, or towards a term of classes. The vouchers can be applied towards the cost of any course, workshop, drop-in classes or multi-class card. 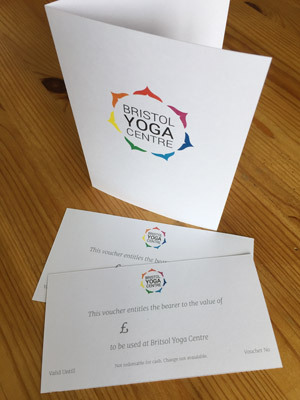 The class gift voucher enables the gift recipient to go to any class at Bristol Yoga Centre (as long as there is space). Or you can put them towards the cost of a workshop or course. The workshop gift voucher enables the recipient to book into any Yoga or Pilates workshop at YogaSpace. Or you can use it to attend single classes or apply it towards the cost of a course. The private class gift voucher provides a personal lesson at a time suitable to the recipient at the studio with one of our well-trained teachers (you can choose the teacher or we will help you decide if helpful). Daytime and weekend classes available. Gift Vouchers are valid for a year and with a wide range of classes available there is something for everyone. They make a wonderful present for friends and family. Please get in touch for details on how to purchase. We can usually issue vouchers the same day if using direct bank transfer.